This article, the first of two parts, is adapted from a chapter in “Readings in White Collar Crime,” Second Edition, from David Shichor et al. (Long Grove, Ill.: Waveland Press Inc., forthcoming). Reprinted by permission of Waveland Press Inc. All rights reserved. 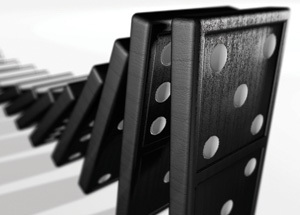 When the American economy slowed in 2007 and home prices stagnated, a domino effect relentlessly began to play out. Unemployment rose, which further incapacitated homeowners without standby assets. Consumers couldn’t make credit card payments and became wary of going further over their heads financially. Automobile sales plummeted and businesses became strapped for cash. Those dependent on bank loans found lending institutions short of funds and reluctant to give up what little they had. In the wake of the foundering economic conditions, the public realized that large businesses had rewarded their executives with what many regarded as obscene salaries and bonuses even while the companies’ balance sheets showed staggering losses. These multimillion-dollar bonus payouts were arranged by boards of directors that had been chosen by the very executives who “earned” the huge sums paid out to them (Friedrichs, 2009). It didn’t take long before the American economic system collapse was matched by similar financial catastrophes in countries around the globe. In the fall of 2008, for instance, Iceland’s government declared bankruptcy; it no longer was able to meet its foreign debts. The krona, the national currency, had almost no value so the country couldn’t pay for the imports that are essential to existence on the isolated island (Wessel, 2009). The U.S. federal government, first during the lame duck days near the end of the administration of George W. Bush and subsequently in the Barack Obama presidency, poured billions of dollars into banks and other financial giants in an attempt to revitalize commerce, or, at least, to keep matters from getting worse. But many of the companies that received bailouts continued business as usual. And the media showcased in spectacular fashion the top executives’ greed as the embittered world watched on in disgust.